We are excited to offer a stimulating and loving Christian environment for your children. Our teachers assist preschoolers in developing their potential as children of God. We look forward to the many special activities we will share with your children as well as the entire family. Our program is based on a developmental philosophy that focuses on fundamental principles of the growth of children. The emotional, spiritual, physical and intellectual stages of children occur in a predictable, orderly pattern. However, the time sequence of these stages is unique to each child. In addition, each child has his/her own individual style of learning. Our Christ-centered, emergent curriculum provides “hands-on” activities that develop early learning skills and encourage children to become critical thinkers, researchers and life-long learners. Invaluable learning also takes place through social experiences that encourage problem solving, creative thinking, cooperation and Godly character development. 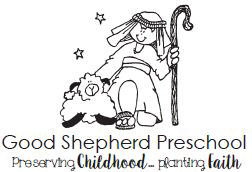 Our activities and educators make Good Shepherd Preschool an inviting place for children to form a strong foundation for school readiness and Christian character. Upon leaving our school, children are better able to make appropriate choices and sound decisions and have developed emotional security, independence and a sense of worth through God’s love. Join us on this exhilarating journey of discovery, growth and delight! We look forward to having you become part of our Good Shepherd Preschool family!